There were three things CTN wanted to be when he was a wee little lad growing up in New England: CTN wanted to be the starting goalie for the Boston Bruins, wanted to be a rock n' roll guitarist like Angus Young, and wanted to be the radio voice of the Boston Red Sox. CTN, however, wasn't quite good enough to make his high school team and gave up the goaltending gig at the age of 16 with nothing more than some fond memories and wonky knees to show for that endeavor. The Bruins survived the loss. On the music front, CTN can't carry a tune in a bucket and never learned how to play the guitar, so fronting a band is out of the question. CTN must say that he was a pretty good air guitarist back in the day. And if anybody has ever heard CTN's natural Rhode Island accent, you probably understand why it was strongly suggested that CTN switch to written journalism shortly after enrolling in broadcast journalism curriculum at Syracuse University. But things worked out OK. CTN didn't play hockey, but he gets to write about it on a daily basis, and that ain't too bad. But the moral of this story is that it is good to have dreams – especially when you are young. They get you out of bed in the morning – or afternoon, if that is the case – and make you move forward in your chosen area of development. That is one of the reasons CTN loved Juke Box Hero the first time CTN heard it. It is one of those songs that CTN can still remember hearing for the first time: mowing a neighbor's lawn with an old-school Sony Walkman clamped to the belt. It is perhaps the best song about dreaming out there. Who can't picture themselves standing outside an arena, listening to the roar of the crowd and dreaming that one day you would be the one inducing that roar. It is nearly a universal dream. The reason CTN drags out this oldie but goodie from Foreigner is because it is a perfect theme song for this week's Opening Faceoff, which focuses on the 10 draft-eligible players that CTN would target on draft day if he was at one of the 30 NHL war tables this June in Ottawa. Let's remember that these 10 draft-eligible players are not the 10 best players available in the draft. If CTN wanted to do that, he could just run quick blurbs on the top 10 players in NHL Central Scouting's mid-term draft rankings. No, these are 10 players that have intrigued CTN as he has prepared for this year's draft. The NHL Entry Draft, for CTN, is one of the best dates on the hockey calendar. CTN spends much of the year talking to the kids, to scouts and others about these young men that will be the future stars of the NHL. As anybody that has spent any time reading Crashing the Net, it is quite obvious that CTN has a definite type, preferring big, physical players over smaller, finesse players. So understand that there will be an inherent bias based on CTN's own preferences, but these are 10 players that should make some NHL noise in the not-too-distant future. CTN would love to hear about the draft-eligible prospects that intrigue you as well. Drop CTN a note with the players and the reasons you are so excited about them. We'll publish the best ones in upcoming issues of the Penalty Box. Remember to include your name and hometown when you send in your nominations. Kyle Beach, Everett, LW – What's not to love about this young man? He is the classic power forward, playing in the Western Hockey League, a classic power-forward league. Look at the numbers. He has 27 goals for the Silvertips, second best on the team, and 60 points. He has a whopping 222 penalty minutes in 60 regular-season games. He will do anything to win and is unafraid to stand up for teammates. At 6-foot-3, 203 pounds, he has the build to handle the physicality of the NHL. John Carlson, Indiana, D – CTN is partial to Carlson, having seen him first play as a 15-year-old in Tier III Junior A competition. But CTN is not letting loyalty be a blinding agent here. Scouts rave about Carlson's all-round game and stress that he has NHL-caliber offensive skills. His recovery speed is highly underrated. Currently ranked No. 19 among North American skaters by NHL Central Scouting, CTN would not be surprised to see Carlson go in the first round. Mike Del Zotto, Oshawa, D – This player has been analyzed every way possible and suffered for it. His game is not one that can be easily broken down as he is a sum of some pretty nondescript parts. Regardless, his overall game is very good and he can be a difference maker at the next level, especially with his offensive abilities. He does not need teammate John Tavares to be successful. His stock is falling in the eyes of some scouts, but CTN is still quite bullish on Del Zotto's future. Jakob Markstrom, Byrnas, G – CTN loves good young goalies. And Markstrom seems to be the real deal. Some people have said he is the best Swedish goaltending prospect since Pelle Lindbergh. That's quite a comparison and might be a little bit unfair. But there is no denying that he is a very good goaltender. Only very good 18-year-old goalies see time in the Swedish Elite League. CTN is highly excited to see what Markstrom can do when he comes to North America. 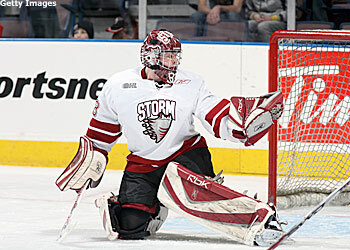 Thomas McCollum posted a 25-17-3 mark with a 2.50 goals-against average with the Guelph Storm. Thomas McCollum, Guelph, G – CTN really liked what he saw from McCollum at the United States National Team U-20 training camp this summer in Lake Placid, N.Y. McCollum had a lot of competition and did not start off strong, but he battled throughout the camp. He has been strong this season in the OHL, though, posting a 25-17-3 mark with a 2.50 goals-against average and a .915 save percentage with the Storm. Kruise Reddick, Tri-City, C – At just 5-9, 165 pounds, Reddick is smaller than CTN's usual prospects. But Reddick makes up for a lack of size with unbelievable smarts. Combine that with above-average speed, and you have the makings of a NHL-ready playmaker. According to scouts, Reddick can play all three forward positions, but is a natural centerman. In his second WHL season, Reddick has enjoyed a 52-point increase in offensive production and finished the year with 74 points. Plus, who wouldn't want a guy named Kruise on their team? Ian Schultz, Calgary, RW – Schultz was barely noticed early in the year. In fact, he is just No. 94 in the mid-season rankings from NHL Central Scouting. But Schultz is another one of those prototypical power forwards plying his trade in a league that will hone his skills to a razor's edge. Schultz only has 15 goals and 15 assists this year for the Hitmen, but his skill set and body frame project very well to being successful at higher levels. Steven Stamkos, Sarnia C – This kid is ranked No. 1 in the mid-season rankings for a reason. Go look at the numbers, especially the results he is putting up in the first round of the OHL playoffs. Enough said there. Michael Stone, Calgary, D – Another sleeper on the Calgary roster, the 6-foot-3, 206-pound Stone has come on strong with a solid year for the Hitmen. He sees a lot of time as Karl Alzner's defensive partner, so that should tell you something about his abilities. He has the ability to disrupt the cycling game and makes good decisions with the puck on his blade. Plus, he is an above-average skater for his size. He should go higher than his mid-term ranking of No. 51. Vjateslav Voinov, Chelyabinsk, D – This Russian defender had a great Super Series this summer for a disappointing Russian team, but he had a sub-par World Junior Championship for a stronger club. What does that mean? CTN doesn't know. But, CTN knows this much: CTN loved Voinov's game in the Super Series. The defenseman showed he could do everything for Team Russia – shut-down duty, power-play duty, you name it. In fact, he reminded CTN a little of a young, raw Sergei Zubov. CTN will take that any day.